Water Spinach Farmers Struggle To Recover After Hurricane Harvey : The Salt Water spinach is a staple among many Asian-American families. Texas is one of the few states where it's grown commercially in the U.S. Farmers there are still struggling to rebuild after Harvey. Sok Sum wraps a rubber band around freshly cut water spinach inside a greenhouse behind his home in Rosharon, Texas. Water spinach goes by many other names. A staple among some Asian-American families for stir-frys and soups, this stalky vegetable with arrowhead leaves and hollow stems is known as ong choy in Cantonese and rau muống in Vietnamese. But in a Cambodian-American community tucked down the gravel roads of Rosharon, Texas — about a half-hour south of Houston — most people call it by its Khmer name, trakoun. Often sold in the produce section of Asian-owned supermarkets around the country, the vegetable is the main source of income for many families in Rosharon. 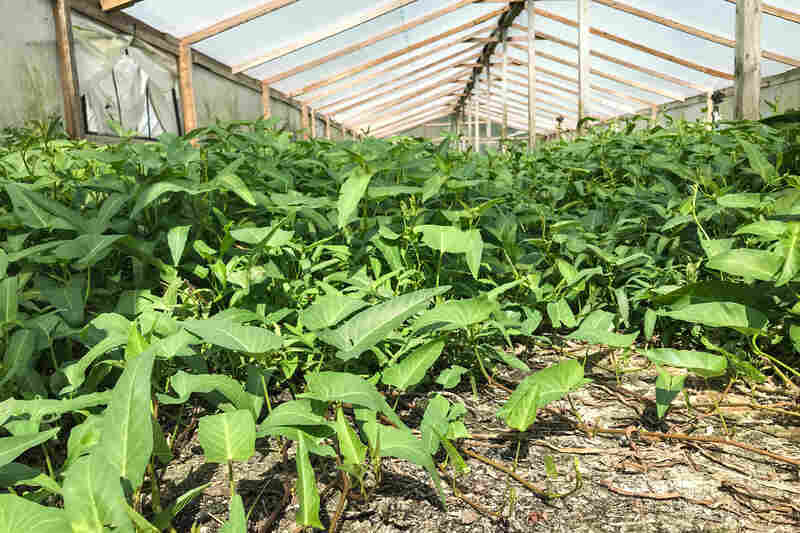 A highly regulated, invasive plant, water spinach is grown in greenhouses in Rosharon, Texas. This country town is one of the few parts of the U.S. where water spinach is grown commercially. The Texas Parks and Wildlife Department has issued more than 50 active permits in Rosharon for growing water spinach, a highly regulated, invasive plant that the federal government considers a noxious weed, making it illegal to sell across state lines without a permit. 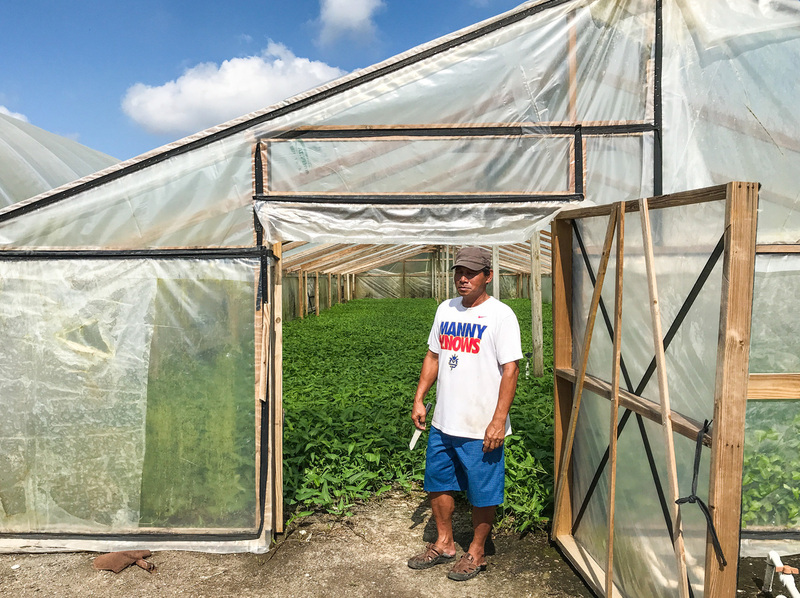 But almost two months after Hurricane Harvey and historic flooding totaled many of their homes and damaged their water spinach greenhouses, the farmers are still recovering, worried about what will happen to their way of life. Before Harvey, Sok Sum and his wife, Sreyaun Pin, would often spend early morning hours crouched inside the three greenhouses behind their home, each more than half a football field long. Harvesting water spinach inside the plastic-covered greenhouses too late in the day could mean getting heat stroke, Sok says. "This is hard work. When you see stuff at the store, the vegetables, you don't know how hard work over here is," he adds. Water spinach farmers in Rosharon, Texas, are worried about the fallen beams and torn plastic sheeting for their greenhouses as winter approaches. With a meat cleaver from his kitchen in his left hand, he would whack close to the water spinach vines snaking across the greenhouse's dirt floor, cutting down stems sprouting just below his knee. 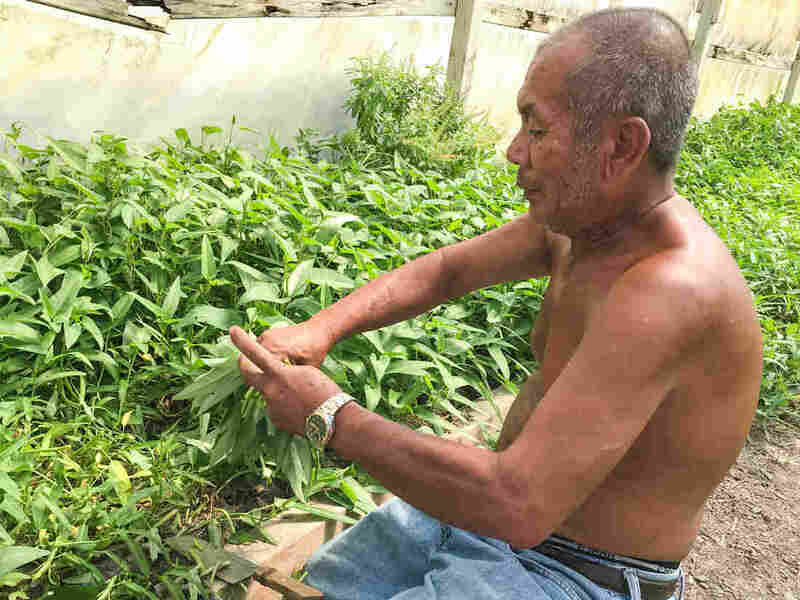 In about two hours, Sum and his wife would fill a 25-pound box with small green bouquets of bunched-up water spinach to sell to a local supermarket or wholesaler. In a week, they could earn about $300 to add to the disability benefits Sum has been receiving since he was injured in a welding accident at a factory job. But Sum says he hasn't been farming since Harvey, and the flooding turned his home into a ramshackle shell. It took about a week before the water receded in Rosharon and he and his neighbors could return to their houses. "When I opened the door, I was crying," Sum says. Pin, Sum's wife, says donations from churches and volunteer groups have helped them survive since Harvey. They and other families have been replenishing their supplies with donated bottled water, baby formula and other essentials stacked around the temple altar of the nearby Buddha Raksmey Monastery. "Now, it's better, but [we] still need help," Pin says. They lived in a tent in their front yard with their 10-year-old daughter for weeks, waiting for their house to dry out. In black marker, Sum wrote above the tent flap: "We are strong here." 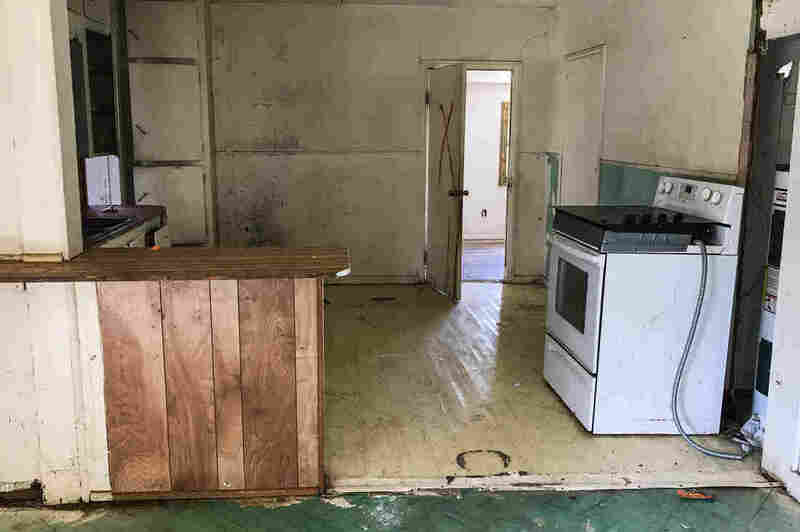 But finding snakes on their property convinced them to move back into their house, even though it was still damp inside and some rooms smelled moldy. Now, Pin says they and many of their neighbors are worried about the fallen beams and torn plastic sheeting for their water spinach greenhouses. Flooding from Hurricane Harvey destroyed Vuth Yin's home. 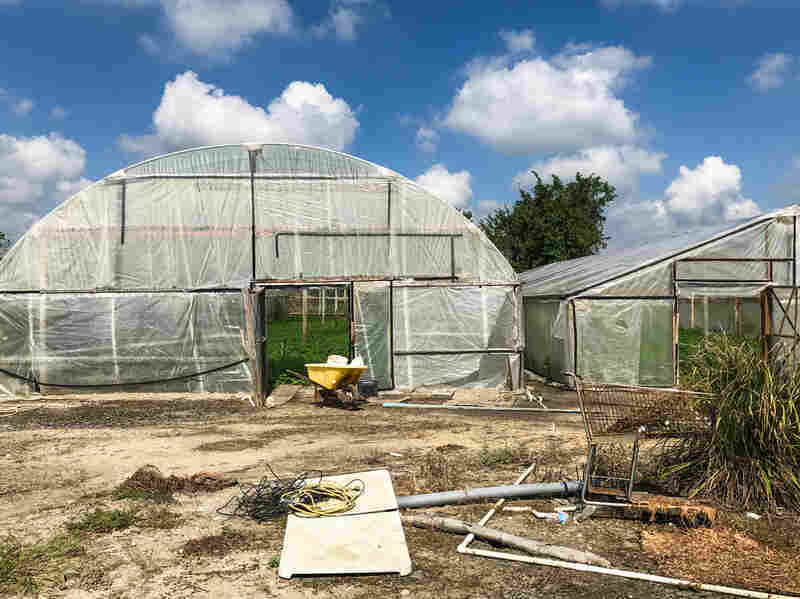 Vuth Yin lives down the road and says his greenhouses need work, too, after the flood. "But I don't have time to fix it," he adds. He's been busy building a one-room house in his backyard to replace his flooded home for his family of eight. But even after their greenhouses are repaired, it's not clear when Rosharon's farmers can start selling water spinach again. Water spinach is the main source of income for most Cambodian-American families in Rosharon, Texas. But Vuth Yin says rebuilding his home after flooding from Hurricane Harvey has kept him from farming. At least one supermarket in the Houston area says after Harvey, it stopped selling water spinach from Rosharon because it's worried about possible contamination from the flood waters. The Hong Kong Food Market, located inside Houston's Hong Kong City Mall, has only been selling water spinach from California and Florida, according to David Le, an employee at the store. Still, Yin says as a former refugee from Cambodia, he's been through a lot of challenges. "Everywhere," he says, "you have to fight for a piece of life."